"I created this with ingredients I had in the pantry, and it turned into a family favorite!" Fill a large pot with lightly salted water and bring to a rolling boil. Stir in ziti and return to a boil. Cook pasta uncovered, stirring occasionally, until tender yet firm to the bite, about 10 minutes. Drain. Heat oil in a skillet over medium heat; add onion and green pepper. Cook and stir until soft, 5 to 7 minutes; remove from skillet. Place chicken into the skillet; cook and stir until no longer pink, 7 to 10 minutes. Combine salsa, cream cheese, and taco seasoning in a saucepan over low heat: cook until cream cheese is melted, about 5 minutes. 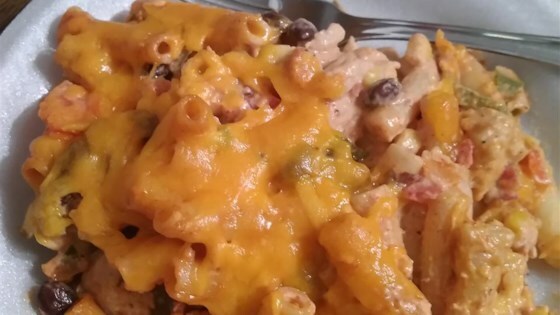 Combine ziti, chicken, salsa mixture, black beans, corn, and onion mixture in a large bowl. Add 8 ounces Cheddar cheese; mix until combined. Pour into a baking pan. Bake in the preheated oven for 20 minutes. Remove from oven; top with remaining Cheddar cheese. Bake until cheese is melted, about 10 minutes. Mexican cheese blend can be substituted for the Cheddar cheese. I switched out half of the cream cheese for sour cream and left the salsa out as well. It was delicious! yes.the whole family loved this recipe. I think chopping the pepper and onion would be better. Will make again. Excellent. I stirred in about a cup of chicken broth before baking.